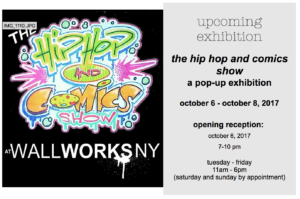 I am honored to announce I will have two pieces featured in the HipHop and Comics Show at WallWorks NY Gallery from October 6-17 in celebration of New York Comic Con and our annual HipHop and Comics Panel which I founded many years ago. I will be in very good company surrounded by some truly legendary artists. Friday the 6th is the opening and I hope you can come join us and hang out and enjoy some art. I’ll be posting photos and maybe some video as well when all is said and done. Stay tuned. Here is our Facebook page for more info. And the website for the gallery. In the meantime I apologize for a delay in Punk Taco updates as this exhibit is taking me away from the book for a few days. Thank you all for you your constant support.